Sometimes I think that we don't die of old age, we die of the accumulated sorrow of missing our friends. Yesterday, one of the most generous and unfailingly pleasant people I have ever met died. 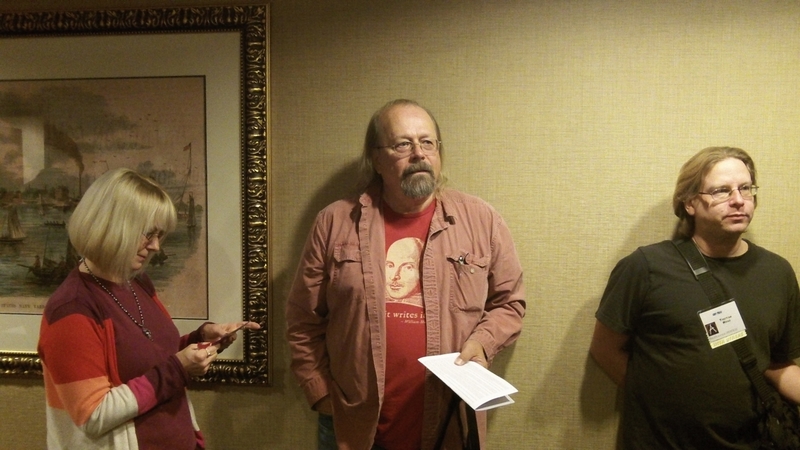 Rick Hautala was a pro, but at NECON or Anthocon, he always had time to listen to little people and talk with us. He was great person to talk with, a straight shooter, and a magnificent storyteller. Rick was unfailingly critical of himself, and spoke frankly about his depression, and his struggles to be motivated. In that, we had a lot in common. Only I'm still too insecure to talk about it. It was incredibly reassuring to hear that someone so successful and talented as Rick struggled. That he was able to talk about it told me about his strength of character, and that let me know that I was not alone. I didn't know him well enough to call him 'brother' and I never had the privelige of working with him. But I did appear between covers with him in Epitaphs. His story, "Perfect Witness" was typical of him, brilliant. In an unpublished book, someone I invented representing a fictional religion once said "We are like stars. And even if we aren't there, our light still reaches out to those around us. We are not gone, we are not forgotten, so long as that light is seen." Rick may be gone. But his light will be felt for a long the in the hearts and writing of many for years to come.